Jessica's Art Blog Updated on Sundays! Check out the blog for new demos and projects. The Importance of Noir in My Work: Photography, Painting and Ceramics - In-House Residency at Eutectic Gallery & Mudshark, LLC. Portland, Ore.
My digital photograph of a certain area of Portland, rephotographed with low light. I guess it’s because of my German soul. That’s right! Thanks to a class on Film Noir that I am taking through OSU at Cinema 21 in Portland, I started researching this “vague” of cinema, Film Noir. It led me to make a lucky discovery that links concepts from this cinematic movement and its roots to the mood and content of my recent photography and paintings, and it’s all tied to light. I have been exploring this mood in a certain area of Portland at night with paintings, photography and ceramic captures of that same area. 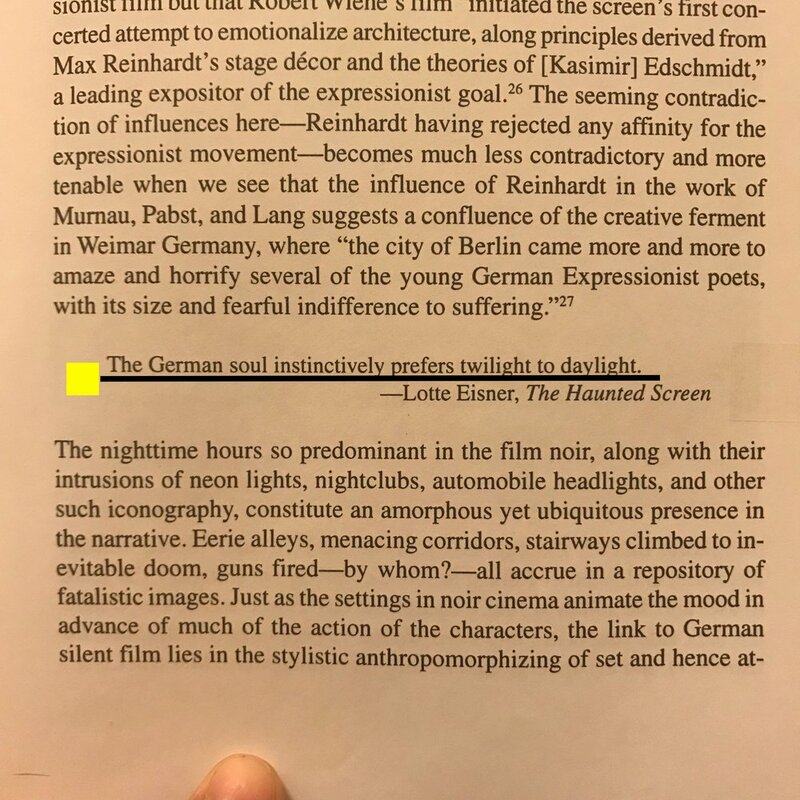 I’m grateful that these concepts are articulated with terminology from scholars of art and film, so that I too may communicate more deeply and with more authority about this mood and the work I’ve been making in attempt to research and capture it. I’m learning the words to say just what I mean and nothing more, or how to push what I’m saying about my work when reflecting on the work I’m making, and how I’m making it. So this means that the mood which inspires the art both forms and informs the artwork—it is as if the captured mood is the art, and this is displayed through the use of lighting and milieu. I have also been looking at this in the photography of Brassai, Paris de Nuit and thinking about the links between clarity, obscurity and light. It seems that when things are clear, they do not have the same mood as when they are obscure, and I think this has a lot to do with why I like to look at things at night (under the streetlight). I always loved the aesthetic of 40’s art, fashion and industry which informs and is reflected in American Noir movies of the century…but, it turns out that the roots of this aesthetic relate a world much earlier than that, and they go further than simply cinema circuits. It turns out that the roots of exploration in early German photography and cinema that informed German Expressionism also informed French cinema of the early to mid-1900’s, which greatly informed American cinema—and all these moods informed an aesthetic that related the cultural and social moods of these countries through film, in turn informing the society which saw these movies—our grandparents and parents. The visual impact of Noir, from German to French to American, has set a tone for aesthetics in our country for decades and, I propose, continues to inform our aesthetic because it draws from the powerful and timeless effects of aesthetics tinged with stimmung. We can even look back to historical art references as evidence of the use of light affecting emotion—works from Rembrandt, Vermeer, Goya and Kollwitz to name a few—to describe the intense power of lighting in eliciting visual mood. However, what the Expressionists and film noir contain in addition to light effects is the melancholy and despair of living in modern times—”a kind of film …that embodied in its narrative concerns the disruptive, dark forces that drive and deplete modern, urban man” (Dickos Introduction)—and these are elements of the content I also attempt to express in my work, using light, milieu and documentation as indicators of mood: the isolation, dread, alienation, tinge of melancholy and uncertainty of modern living. The big difference is that I am also laughing about these feelings because I know they are all products of our own shortsighted aims of industrialization, and because it seems the most beautiful sights in our modern life come about where there is only the remainder of man’s impressions but no man in it—when the low light obscures what is otherwise too crystal clear. There is beauty in light bouncing off a building in an isolated part of town, and it’s funny to me as a legacy—a life of shouting against the dark by looking at what creates the shadows with appreciation for their obscurity. I have certainly seen a Noir aesthetic affecting my “eye” in the work I am making and this has translated to how I am using photography, painting and sculpture. I agree that it is a mood (stimmung) that I am channeling and pointing out in my work, based on lighting and the architecture of areas of Portland that have a feeling, leftover, of the 40’s and a sense of the fringes of human drama in their alleyways and urban environments. This solidification of conceptual framework and particularly this book (Street With No Name) are giving me excellent touchpoints for explaining what I am looking at in my work and aesthetic explorations of the world. Phew. I’m so glad that this week resulted in some of this thesis-level defining and discovering, so that I can again dive into the work with a renewed sense of understanding. Phew, phew, phew. Following are some shots of the collection of impression fragments in porcelain from buildings of that area in Portland this week. I hope that they will turn out and be exactly what I wanted, although they have already become something more. I will execute another round of these impressions once I have reviewed the product from this firing. Tools of the trade…when your trade is making night collections with porcelain. Here they are drying in the studio and then going into the kiln...LaCroix included for scale. I’ll use what I learn from making and firing these to continue the path with porcelain impression fragments that will inform the collection or “suite” of street-inspired stimmung I am creating. These pieces were loaded into the BLAAUW kiln at OCAC in order to start working in combination with painting and photographs. I hope these pieces will exude the stimmung I’m looking for. In this last part of photos, I feature the work I’m making in studio (OCAC) and in residence at Eutectic Gallery & Mudshark. Working on these pieces in sketch and painting allows me to research stimmung further, investigate composition and the effects of light, and to continue to feel inspired in the way I’m looking into content, research and making.